What is Gibbs' phase rule? How to use Gibbs' phase rule calculator? Gibbs' phase rule calculator assists you in calculating the number of degrees of freedom for the phase rule. In the article below, you can find the explanation of what is Gibbs' phase rule, Gibb's equation and some information about how to use the calculator correctly. Scroll down to find out more! Gibbs' phase rule bases on the laws of thermodynamics and provides the theoretical principle for characterizing the chemical state of a system. It predicts the equilibrium relations of phases and is present as a function of physical conditions such as pressure and temperature. Moreover, phase rule allows creating phase diagrams to represent and interpret phase equilibria in heterogeneous systems. "P" is the number of phases in the system. "Factor" (by default = 2) is an integer value in the equation that depends on the temperature and pressure of the system. If one of these variables is constant, you have to change its value to "1". If both of them are constant change the value to "0". This equation allows computing the number of degrees of freedom (F) from the number of components (C) and the number of phases in the system (P). C means the minimum number of chemical components required to constitute all the phases in the system. The compound cannot be a product of the chemical reaction between other components of the system. F refers to the number of variables (e.g., temperature, pressure, the concentration of the component) which can be changed independently (with certain limits) without altering the state of the system (e.g., the numbers of phases and compounds). The number of degrees of freedom increases with the increasing number of components and with the decreasing number of phases in balance. Choose the chemical system for calculations. Let's assume that it consists of 1 component which is present in 2 phases. In that system, both pressure and temperature can change. Type in the relevant numbers into the calculator: the number of compounds and number of phases, the factor is equal 2 for that example. 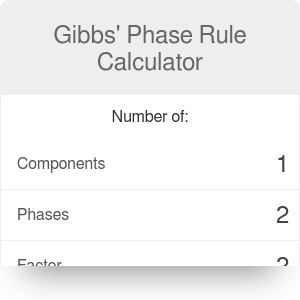 Now you can do your calculations with Gibbs' phase rule calculator. Gibbs' Phase Rule Calculator can be embedded on your website to enrich the content you wrote and make it easier for your visitors to understand your message.